Our customers have always been ahead of the curve – understanding that an investment in distillation is an investment in health, safety, and long-term savings. 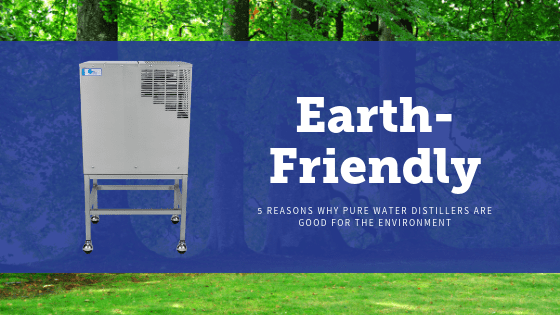 But you may not have realized that choosing to distill your water with a Pure Water distiller also has wide-reaching benefits for the planet too. 1. Our distillers are built to last. This means that you’re not filling landfills with cheap, broken appliances. In fact, we're great at avoiding landfills. Some of our distillers have been running for over 40 years, and our customers distill hundreds of thousands of gallons of water every year. Think of how many natural resources have been saved! BONUS: When you you distill your own water, you're not blowing your money on bottled water either. This cuts down on single use plastics. Not only are we not creating more waste, but we’re also helping to reduce the amount of oil used for plastic bottle production, the fuel costs to deliver the water, and so much more. 2. Our distillers waste much, much less than the alternatives. One of the most common alternatives to distillation is reverse osmosis, but many people fail to realize how much water these systems waste. As a rule of thumb, most R.O. systems waste about 4 gallons of water for every gallon of water purified. Some R.O. systems claim zero waste because they pump the waste water back through to be used again, but this makes the membrane break down faster. This creates another type of waste because you’ll need to replace the membrane more often. Our distillers, on the other hand, don't waste water. 3. Our distillers don’t put harsh chemicals into the environment. Municipal water systems take some things out of the water, but they also deal with things like pathogenic organisms by adding things into your water to kill them. Chlorine is one of the most common disinfectants, but other chemicals are used too – like the controversial and potentially dangerous HaloSan. These chemicals can end up in our bodies and in our environments. Our distillers are entirely focused on removing these harsh chemicals. So, for example, if you water the flowers in front of your house with distilled water, you’re not introducing those chemicals into the soil. 4. Our distillers are built to use minimal electricity. Our ingenious engineers have designed our distillers to minimize the amount of electricity you’ll need. Every unit shuts off on their own when they’re done distilling! Our automatic units turn off when the storage tank is full, and our countertop units turn off when the boiling tank water is low. Not only is this safer, it also means you’ll never have to worry about using more electricity than you need. And just how much electricity is that? It all depends on how much water you need. Let’s take our Mini Classic as an example. It is rated at 800 watts, which it only draws when it’s in use. It takes 3 hours to make a batch (.8 gallons). You’re probably more familiar with kilowatt hours (that’s what they use on your electric bill), so we’ll convert it into that by dividing 800 watts by 1000, which equals .8. If it takes 3 hours to make a batch, that’s .8 x 3 which is 2.4 kWh to make a batch of distilled water. If you think in dollars and cents, the electric company charges per kilowatt hour, which is, on average in the United States, about 12.47 cents per kWh. So 2.4 kWh x 12.47 cents is roughly 30 cents of electricity per batch. 5. Our distillers have a team of experts behind them. What does this have to do with the environment? On top of everything else, we also have a service center that’s here to help you maximize what you’re doing. We can answer questions about your water, and we’ll help you maintain your distiller to keep it running at peak efficiency. If anything goes wrong, we'll help you fix your distiller rather than treat it as disposable. Don’t let your investment go to waste (or create waste!). Choose a Pure Water distiller and the team that stands behind it. Questions? Comment below or email us at info@mypurewater.com! We’re happy to help! And are you ready to buy your own distiller and do your part to protect the environment?